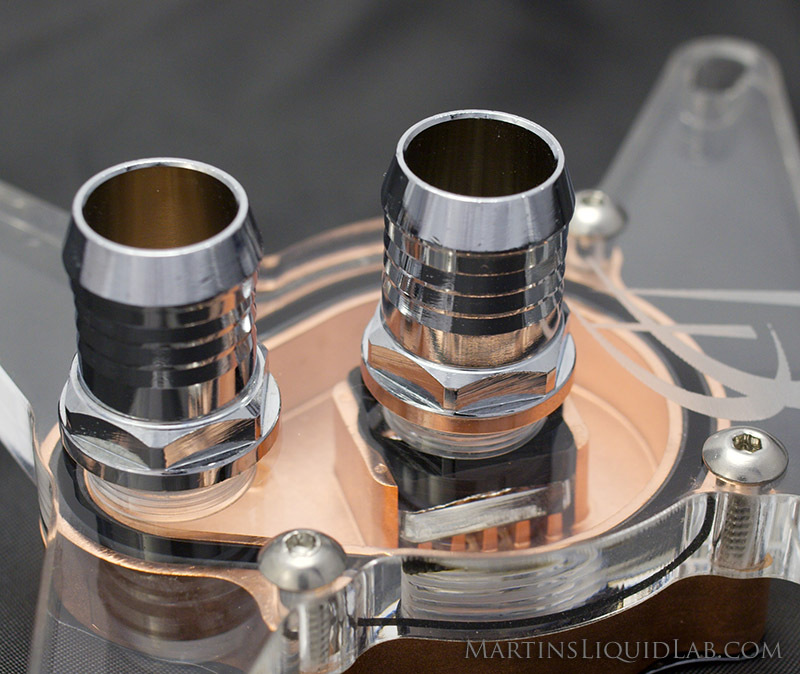 Welcome to my review of some Danger Den high flow water cooling fittings. I'll be adding more fitting to this page in the future, but currently looking at the new Danger Den barbs, expect to see them very soon! 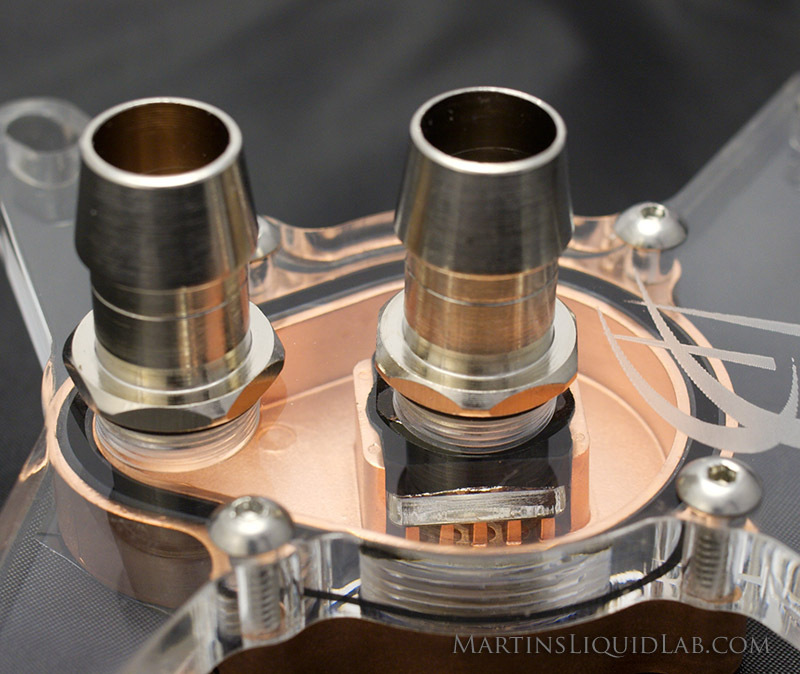 Barbs are such an important part of water cooling. If barbs are installed incorrectly or the tubing is poorly installed, this is the area where the dreaded leak can occur. 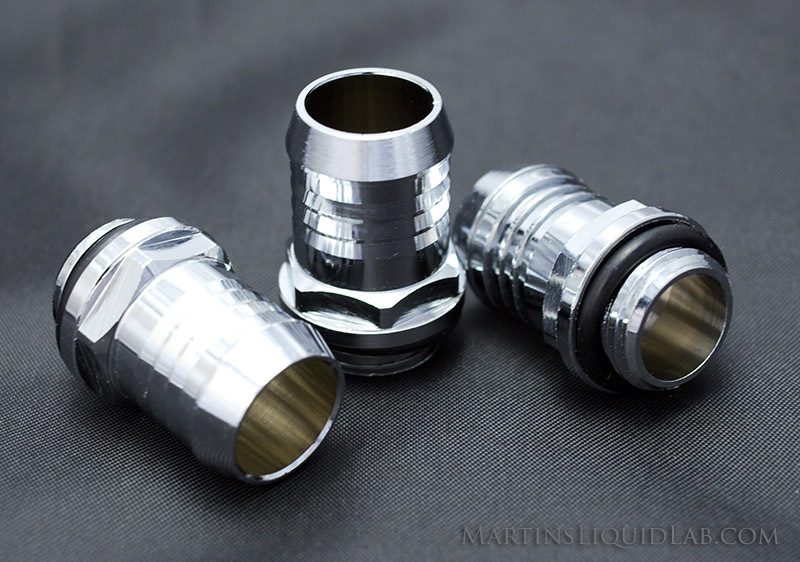 Water cooling barbs in general are slightly oversized with an emphasis to mimize error and the chance for leaks, but current fittings all tend to look fairly similar and only a few have additional features specific to a water coolers needs. 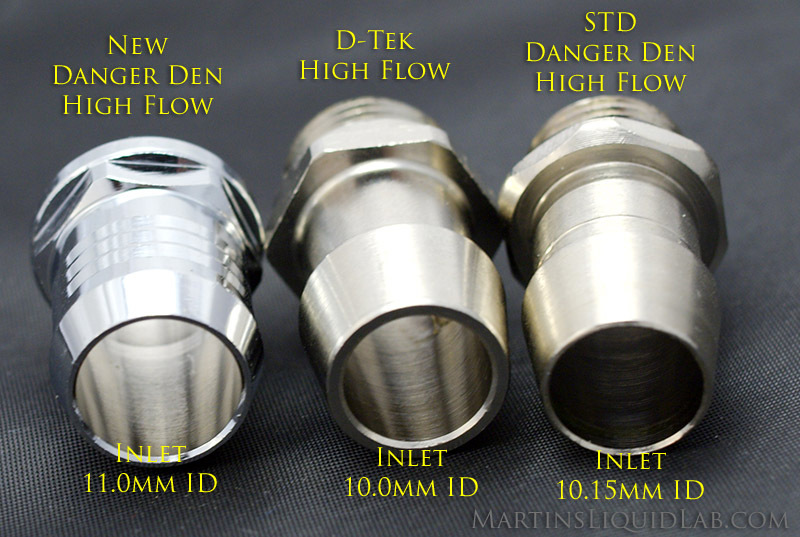 These new Danger Den fittings brings several new features that address prior concerns. O-ring retainer - This retainer prevents the o-ring from displacing which can cause a leak in standard barbs when over-tightened, this allows you to install these with a fair amount of force and now worries about a leaking o-ring. D-Tek barbs also incorporate this very desireable feature. Substantial Oversized Inlet - A standard High Flow G1/4 fitting is typially about 9.9 to 10.1 mm inside diameter which is about the maximum you can remove and still have adequate brass strength for the G1/4 threading. Danger Den has taken an additional 1 millimeter (Total 11.0mm) at the inlet side and provided a very gradual transition before reaching the threads. This will minimize the step down entrance loss from the inside diameter of tubing to the barb. Finish - These barbs have a much finer quality of finish than standard barbs. The machining marks are almost non-existent and the finish appears to be more of a chrome plating than the standard nickel as can be seen in the photos below, leaving a much brighter and mirror like quality. Clamping width - Using worm drive clamps can be frustrating on existing barbs, because the width on many of those clamps just barely fits existing fittings which can be as little as 9.9mm. These new barbs provide about 10.8mm of clamping width. Here are several photos with these new Danger Den High Flow barbs next to a D-Tek and the current Danger Den barb. I used to be a D-Tek barb preferred user because of the o-ring retainer, but these new Danger Den G1/4 barbs have a equally good if not better o-ring retainer, they are oversized on the inlet for better flow, and overall a very sharp looking barb. The barbs are very sharp on the flared barb ends, so they will definately hold your tubing on very well. 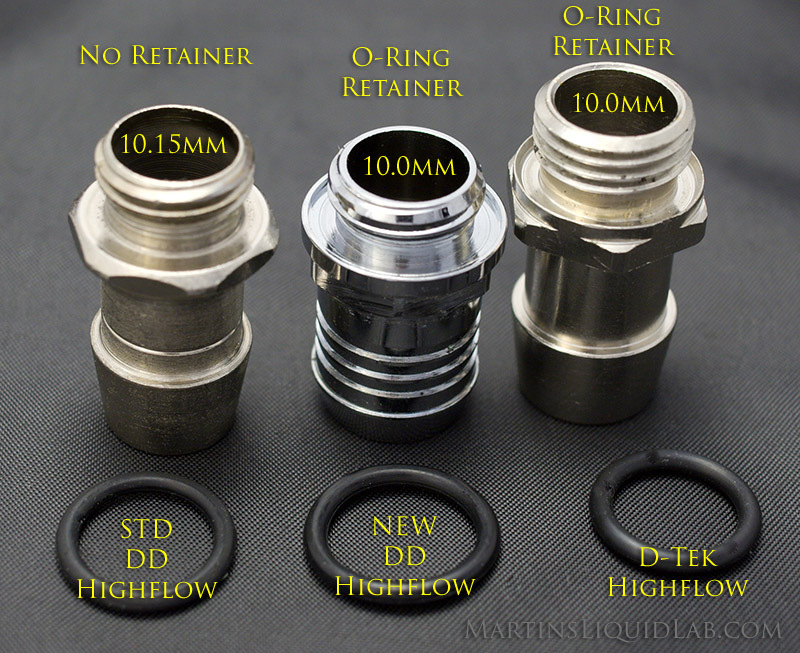 These new Danger Den High Flow O-Ring Retainer Barbs are Superior!